For courses in strategy and strategic management. Core strategic management concepts without the excess. 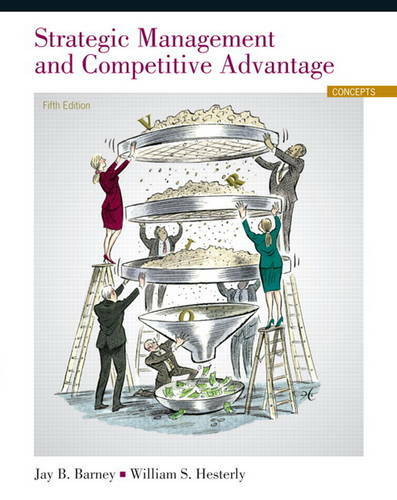 Just the essentials, Strategic Management and Competitive Advantage strips out excess by only presenting material that answers the question: does this concept help readers analyze real business situations? This carefully crafted approach provides readers with all the tools necessary for strategic analysis. Also Available with MyManagementLab Strategic Management and Competitive Advantage is also available with MyManagementLab, an online homework, tutorial, and assessment program that truly engages students in learning. It helps students better prepare for class, quizzes, and exams-resulting in better performance in the course-and provides educators a dynamic set of tools for gauging individual and class progress. Students, if interested in purchasing this title with MyManagementLab, ask your instructor for the correct package ISBN. Instructors, contact your Pearson representative for more information. Teaching and Learning Experience This program will provide a better teaching and learning experience-for you and your students. Here's how: *Improve Results with MyManagementLab: MyManagementLab delivers proven results in helping students succeed and provides engaging experiences that personalize learning. *Help Students Develop Critical Thinking Skills: Proven pedagogy geared towards ensuring students grasp the concepts. *Present Specific Issues in a Flexible Format: Each chapter has four short sections that present specific issues in more depth, allowing the professor and the student to adapt the text to their particular needs.